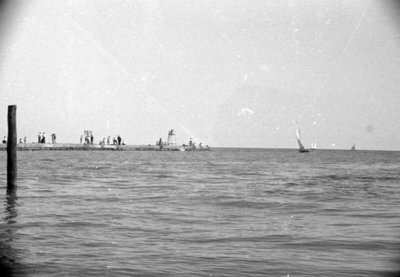 Black and white negative showing the lighthouse on the west pier. In this view people are walking on the pier and there are sailboats in the distance. The lighthouse was built in 1857 and removed from the west pier in 1958. Whitby Harbour Lighthouse, August 1939, Marjorie Ruddy. Whitby Archives A2013_040_047A.